Microsoft is in full-on damage control mode after Consumer Reports removed its recommendation of Surface laptop and tablet products last week. According to a purportedly leaked internal memo, the company acknowledges the issues that its Surface products have had, but executives say the main criticisms have been resolved. Published on August 10th, the Consumer Reports survey was based on responses from 90,000 tablet and laptop owners. Among the most troubling findings, the data estimated that 25 percent of buyers would encounter “problems” within the first two years of owning a Surface product. The Microsoft Surface Laptop (128GB and 256GB versions) and Microsoft Surface Book (128GB and 512GB versions) all lost their recommended status. Widespread reports of frozen machines, unexpected shutdowns, and unresponsive touchscreens were key factors in the downgrade of Consumer Reports rating. 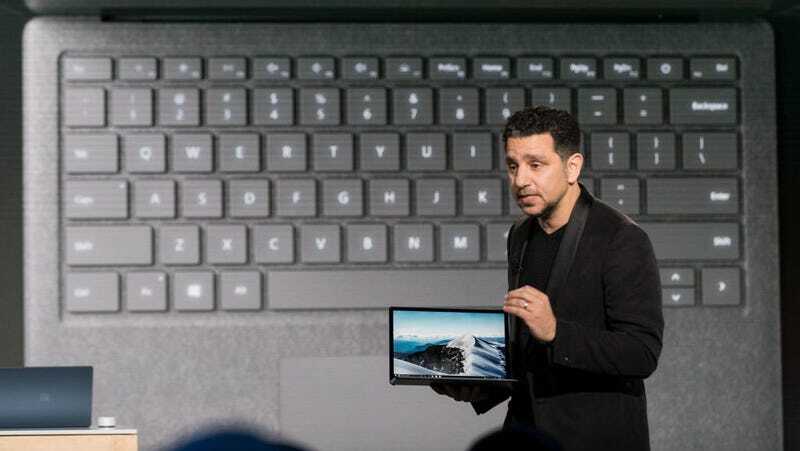 Microsoft immediately shot down the survey’s finding, and in a blog post, Microsoft’s devices chief Panos Panay wrote, “While we respect Consumer Reports, we disagree with their findings.” “Both our predicted 1-2-year failure and actual return rates for Surface Pro 4 and Surface Book are significantly lower than 25 percent,” he wrote. But an internal memo seen by well-sourced tech journalist Paul Thurrott shows Panay being a bit more willing to admit the company’s failures. According to Thurrott, Panay mentions that the Surface Book and Surface Pro 4 had “some quality issues” when they launched but he believes those problems have been addressed since. “These improvements were unfortunately not reflected in the results of this [Consumer Reports] survey,” he told his colleagues. It’s totally unsurprising that Panay’s internal comments paint a rosier picture of the company’s track record. Elsewhere in the memo he writes, “[We] have put together a comprehensive set of data that reflects the strength of our quality and our customer sentiment, and will be working with partner organizations, including marketing, retail, and sales, to share that information broadly.” Getting this internal data out into the public is obviously a high priority for the company. This leaked memo contains just a slightly more detailed take on Panay’s initial blog post. In this day and age, an internal correspondence could give Microsoft’s talking points that extra level of credibility that jaded consumers are looking for. Also, keep in mind that Thurrott says the Surface team initially blamed Intel’s Skylake hardware for the performance issues. Thurrott’s sources say that Microsoft CEO Satya Nadella proceeded to meet with Lenovo executives last year and ask how they were dealing with Skylake problems and no one knew what he was talking about. Apparently, Microsoft’s custom drivers and settings were the real sources of trouble. Given the reporting that even Nadella was in the dark on what was going on with the Surface line, it seems likely that Panay could be skating on thin ice. Microsoft’s earnings have been strong lately, in part due to the expansion of its cloud service. But indications that its nearly five-year effort to push into the hardware market isn’t working would almost certainly cause jitters among investors. Will placing the blame on others and later saying that everything’s a-okay now help improve the reputation of Surface products?